the benefits of getting those systems out of your brain and into an Operations manual! As your practice grows, inevitably, you will want to offload tasks from your plate to other staff. The availability of help including para-planners, associate advisors and virtual assistants is a great way to leverage your time. At the same inference, training on your systems will be up to you. For example, if you are not using a TAMP (Turnkey Asset Management Program), you will need to implement a process to monitor and re-balance your client portfolios. Having a vetted system in place to establish what needs to happen and when will pay its’ way in dividends to avoid costly trade errors. I have lived through three audits in my RIA career and each time there was always a level of fear when the auditors arrived! Yes, the team had a heads up that the auditors would be there, but it still created anxiety! As an advisor, the last thing you want is to be asked to provide a history of your trades over the past 6 months and you have no clue how to produce that information. Alternatively, if someone asked your staff, what is your billing process? Would they be able to confidently share (or provide a resource) to how it is done? Being prepared for an audit starts well before an auditor arrives. It begins with a thorough analysis of your systems and then documenting how things are done. Client experiences are the new buzzword, but more importantly, it speaks to what advisors need to win and maintain clients. It goes beyond the work we do but adds another layer of ‘how we actually do it’. From how the receptionist answers the phone, to how a prospect is received in your office, are important factors to the client experience. Experiences are their own economic offering. Think about why people go to Starbucks? Is it for the coffee and croissants, maybe? However, more importantly, people go there for the empowerment, communication, being known by name, free Wi-Fi and they can stay there all day! It is about what they experience while at Starbucks. Baristas and staff are taught how to interact with each customer. There is an inherent service standard in place. As advisors we should ask, what experiences are my clients having at my firm? Is it consistent? Measurable? Having a documented process also allows you to course correct and continually evaluate how you get things done. Why should a client hire you? Can you articulate your value proposition? What are you providing that is unique to the clients you serve? Advisors who understand the intricate areas of their service operations are better primed to be able to discuss why a client should hire them. Taking the time to understand, map and document your systems provides a chance to do this. The next time a client asks, what fees am I paying and why, you will have a stronger stance from which to answer their questions. 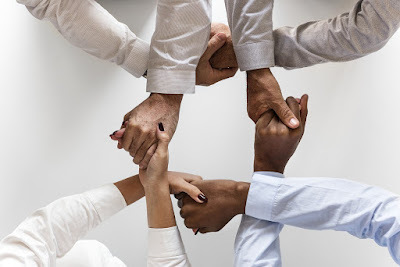 The actual process of transferring ownership of a firm from one generation to the next is often completed by an internal transfer (heirs or employees) or by an external transfer to another entity. The goal here is generally focused on limiting disruption to clients, owners and employees. Many RIA owners have no clear answers when their clients ask ‘who will be my advisor once you are gone?’ The full scope and considerations of the succession planning discussion is out of the scope of this blog post, but it is mentioned to support the advisors quest in documenting systems and pre-planning if they ever want to sell their book of business. As regulatory changes intensify, the succession discussion may force many firms to develop and execute a succession plan. This requires thought, planning, development and documentation. At the end of the day, advisors want to be more efficient, but how? By evaluating your service platform, value proposition and what experiences you want your clients to have can set you up to experience greater flexibility in managing your practice, providing instructions to staff on how to get things done and allow you to spend more time with your clients. About Cameo Roberson, Advisor Consultant & Financial Coach. I am a bona-fide design, systems, workflows and process enthusiast for advisors! your systems? Click here to set up a time to talk live. FIN Compliance (FinCompliance.io) is a consortium of compliance services including: RIA Consults-Roberson Consults Group, a compliance consulting firm, RIA Review, a compliance-management software tool (SaaS), RegTech Products is a product notification portal for product offerings in financial service markets. To advance the customization of advisory compliance programs, we launched a training video series as a part of our regulatory management system with our product. RIA Review is a documentation-based solution to help boutique investment advisors to maintain an internal compliance review program. This system is a part of our solutions at: FIN Compliance. Our Premium and Premium Plus users will have access to our recorded webinar library that contains insight on compliance topics and regulations issued by the: Securities & Exchange Commission (“SEC”), Office of Compliance Inspections & Examinations, Division of Investment Management, FINRA, state securities agencies, and the North American Securities Administrators Association (NASAA). FIN Community (FINcommunity.io) is a business listing and network for providers in the Financial Services, FinTech, RegTech, Crypto and Blockchain communities. We believe in supporting the gig economy through building business opportunities. Moving to FINLancer soon. SoCap Missions (socapmissions.com) provides business support group sessions. In addition, Cory has volunteered for more than fifteen youth programs in locations such as like S. Korea, China, S. Africa, Thailand, and India. 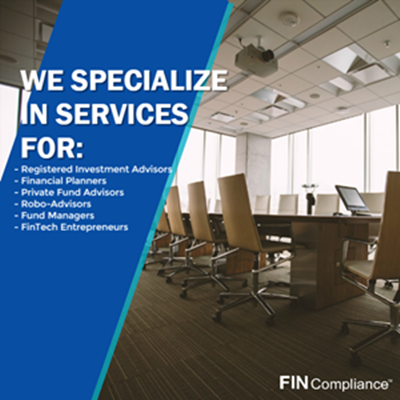 FIN Compliance (FinCompliance.io) is a consortium of compliance services including: RIA Consults-Roberson Consults Group, a compliance consulting firm, RIA Review, a compliance-management software tool (Early Stage--SaaS), and more. His other platform, FIN Community (FINcommunity.io) is a business listing and network for providers in the Financial Services, FinTech, RegTech, Crypto and Blockchain communities (prototype).